As an Industrial solvent for waxes, fats, oils, perfumes, alkaloids and gums. 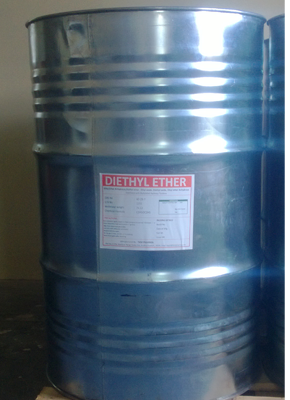 Used as a reaction or extraction medium in the chemical, fragrance and pharmaceutical industries. Used to extract acetic and organic acids from aqueous systems in the cellulose acetate and plastics industry. When mixed with alcohol it acts as denaturant and the mixture is used as petrol substitute under the trade name NATALITE . Packing:In 140 Kg Galvanised Iron barrels. In UN approved barrels and ISO tanks for exports. Used as lab reagent and Analytical reagent. In Amber coloured BT-35 bottles of 500 ml nett capacity. As an Industrial Solvent for waxes,fats,oils,perfumes,alkaloids,gums and an extracting solvent. Used as Anaesthetic (inhalation) in surgery. It provides an inert media for various organic reaction such as wurtz reaction. As a reaction medium in lithium aluminimum hydride reductions ,in Grignard synthesis and many other reactions. In extractions this is being used for low boilers which are sensitive to decomposition. It Produces cooling on evaporation and is therefore used as refrigerant.